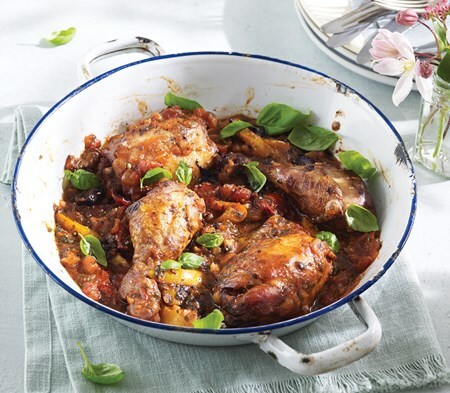 A classic Italian casserole of chicken on the bone, braised in a rich tomato and red wine sauce, garnished with yellow peppers and black olives. A hearty traditional Italian family dish. We follow tradition by using chicken thighs and drummers on the bone, marinated in red wine before roasting, to keep them lovely and moist. The sauce is made by sweating onions, garlic, chopped carrots, bay leaves and rosemary until soft, creating a base packed full of flavour. Our chefs then add the red wine marinade from the chicken, along with tomato puree, chopped tomatoes and red wine and allow this to simmer, before adding lots of basil to give it a wonderful Italian flavour. Finally, it’s garnished with roasted red and yellow peppers, sliced black olives, and parsley. Some crusty bread and a rocket salad are the perfect accompaniments. Please Note: The details above are correct as of 30 November 2018 but as we are constantly improving our recipes it is essential to check the label on the packaging. Chicken Thigh (25%), Chicken Drumstick (17%), Water, Chopped Tomatoes (10%) (contains: Tomatoes, Tomato Juice, Acidity Regulator: Citric Acid), Red Wine (8%) (contains: Preservative: Potassium Metabisulphite), Onions, Oven Roasted Semi Dried Tomatoes in Oil (4%) (contain: Cherry Semi Dried Tomatoes, Sunflower Oil, Salt, Garlic, Oregano, Preservative: Lactic Acid), Yellow Peppers (4%), Tomato Puree (2%), Carrots, Black Olives (contain: Salt), Garlic, Chicken Stock (contains: Roast Chicken, Maltodextrin, Salt, Natural Flavouring, Chicken Fat, Sugar, Lemon Juice (from concentrate), Onion Powder), Parsley, Chicken Glace (contains: Concentrated Broth from Chicken Meat (Water, Extract), Maltodextrin (Potato), Yeast Extract, Salt, Glucose and Onion Powder), Mediterranean Vegetable Stock (contains: Partially Reconstituted Vegetables (Onion, Red Bell Pepper, Artichoke, Celeriac, Potato), Tomato Puree, Salt, Sugar, Maltodextrin, Sun-Dried Tomato Paste (Sun-Dried Tomato, Sunflower Oil, Salt, Natural Flavouring, White Wine Vinegar, Black Pepper), Olive Oil, Natural Flavouring), Basil, Gluten Free Flour (contains: Rice, Potato, Tapioca, Maize & Buckwheat), Rosemary, Salt, Rapeseed Oil, Worcester Sauce (contains: Water, Sugar, Spirit Vinegar, Molasses, Onion Puree, Salt, Tamarind Paste, Cloves, Ginger Puree, Garlic Puree), Sugar, Bay leaf, Black Pepper. Preheat oven. Remove sleeve, pierce film lid & place on a baking tray. Cook in the centre of the oven. Allow to rest for 2 mins before serving. This product contains bones. Steam may be released when removing film lid .